1945. Persephone. Softcover. 377 pages. Several years ago, Frances of Nonsuch Books gave me this book as part of a Persephone Secret Santa exchange. She actually gave it to me in-person because we lived so near each other at the time. I am remiss for not reading this book sooner – I’m often distracted from the books I own by library books. Noel Streatfeild’s Saplings covers several wartime years in the life of one middle-class English family: perceptive father, Alex; self-centered mother, Lena; and their four children: Laurel, Tony, Kim and Tuesday. The story begins as the family is on a beach vacation, on the eve of World War II. The family will soon be separated as the children are to be evacuated out of London, and stay with their paternal grandparents in the country. 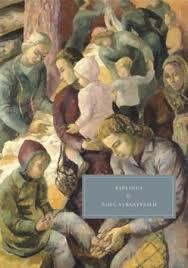 All of the characters in Saplings – particularly the children – have distinct but not simplistic personalities. Besides the parents, the children are surrounded by a constellation of adults who range from caring but constrained former governess Ruth, to the children’s aunt Lindsey, who would rather not be bothered. Streatfeild writes with psychological depth, but the prose isn’t dense with it, thanks to the author’s good sense of pace. Streatfeild is like a judicious film editor with her narrative: scenes are well-chosen and do not drag on. It is an enjoyable book, though not generally a happy one in its trajectory. In the constant background is the war, which takes away some of the adults from the children’s lives and doesn’t always return them. Still, it is a pleasure to read a book for adults that understands children’s nature so well. Streatfeild captures how adults can unthinkingly slight a child, and how that unintentional slight can grow and grow in the child’s mind. There are a couple poignant moments in the book that near about made me cry, when an adult finally is able to intuit the source of a child’s pain and heal it. The following excerpt did not make me cry, but it is thematically of a piece with those that did. The excerpt is set on the day that the eldest girl, Laurel, is departing for boarding school. At this point in the book, Ruth is still employed as a governess by the family. It was not by design that Ruth was alone with Laurel. They had gone to the brook to wash. Laurel, in her green tunic and crested cardigan, looked unlike herself. She made Ruth’s heart ache and gave her courage to say what in recent days she had not risked in case Laurel snubbed her, and the bloom was brushed from their friendship. Laurel looked up from the water. There was a moment when it seemed that a snub was on her lips. Then she was up, her arms around Ruth’s neck, sobbing. Ruth surreptitiously looked at her watch. It would do the child good to say all that was in her mind, but she could not plant her in a railway carriage filled with strange girls with her face swollen from crying. She gave Laurel a kiss. I definitely recommend Saplings to anyone who likes books that depict children in credible, insightful ways, and who have soft spots for scenes where kindly grandfathers, uncles and headmistresses take the time to listen to the troubles of children. 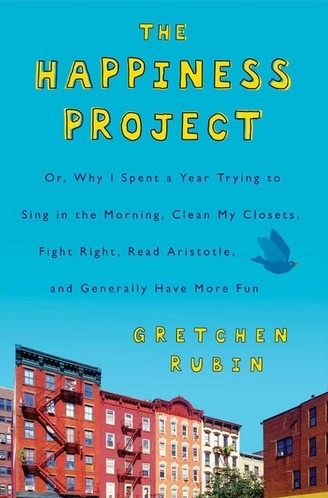 Gretchen Rubin’s book The Happiness Project is a popular memoir / self-help book about the author’s year-long “experiment” at trying to be happier. She presents research on happiness throughout the book and she also seeks to make changes in her own life. Each chapter represents a month of the project and each month is focused on a particular goal, though as I recall, she tries to be cumulative with her goals, so that she’s not abandoning January’s resolutions when she hits February. An example of the book’s organization: February’s chapter title is called “Remember Love” and focuses on happiness in marriage; March’s title is “Aim Higher” and focuses on happiness at work. We tend to overestimate how much we can accomplish in an hour or a week and underestimate how much we can accomplish in a month or a year, by doing just a little bit each day. 1. The quote above has really stuck with me and is the idea I’ve shared most often with other people when discussing this book. In my own life, it helped get me back on track for transcribing my ancestor’s journal, as I reminded myself that if I just do a little bit regularly, even if just a half hour here and there, eventually it will get done. 2. I don’t have children, and I don’t work with them in my job either, but I was fascinated by Rubin’s chapter on parenting. She wrote a phrase: “Acknowledge the reality of people’s feelings,” particularly children’s. I remembered this concept while helping out at my church’s preschool. The service was nearly over so we were encouraging the kids to help put the toys away, but one toddler was determinedly opening up the costume bin and taking out the fireman hat and other props. I tried to gently tell him that it was time to put things away but he wasn’t listening. So I said, “I know, it’s hard – you want to play with these costumes because they look like so much fun!” I followed it up by emphasizing that I see that his family comes nearly every week so I knew he’d have a chance to play with the costumes in another week. And it worked! He stopped trying to take the costumes out. And I did feel that my sympathizing with his desire to play with the toys was key to communicating with him at that moment. 3. Another concept that stuck with me from the book was the encouragement to “Spend out.” Don’t save things for a rainy day. I was already putting this into practice somewhat before I read the book. 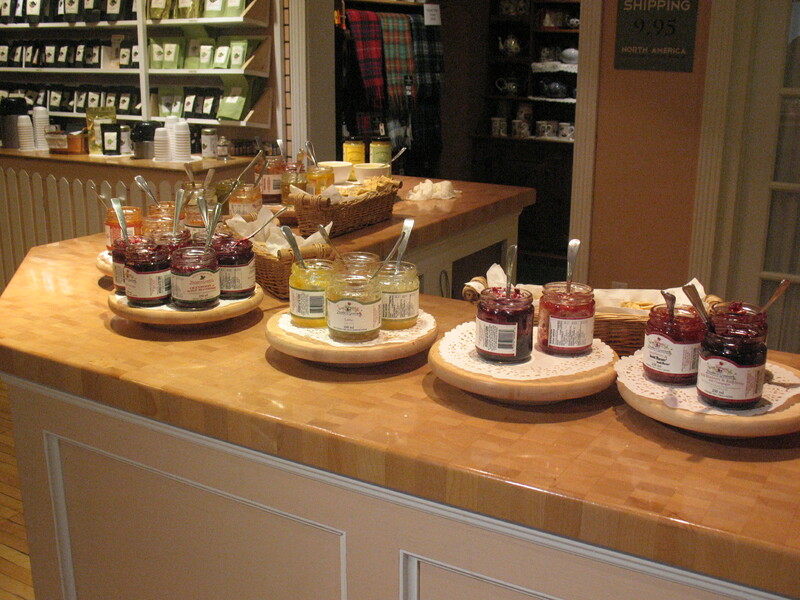 For instance, when I was in Prince Edward Island last summer, I bought three jars of specialty preserves. My tendency with specialty, shelf-stable foods is to keep them for some undetermined special occasion. But this time, I used them right away, in my ordinary PB&J sandwiches I brought to work. It did give me pleasure to eat my sandwich at my desk and be like: “Yum, raspberry champagne preserves!” Rubin’s emphasis on the “Spend out” just makes this idea more of a mantra in my head, as I come across gifted body lotion or a gift card in my apartment. Don’t save it forever, use it! 4. Rubin talks about a “one-minute” rule: don’t put off anything that takes less than a minute. I haven’t remembered this specific rule as much as the general idea of trying to take care of nagging tasks that really don’t take much time to get accomplished. And one similar idea: not putting off buying something that will really help solve a nagging problem. For instance, I wanted to try running at least once a week, but every time I ran I got shin splints. I tried altering my gait according to a running book and a running video I found online but was feeling discouraged. So I did something else encouraged by The Happiness Project: I asked for help. I posted on Facebook. Several people said, “Get proper running shoes. Don’t try to change your gait at this stage.” So I bought running shoes, and lo and behold no more shin splints! I haven’t transformed into a daily runner or anything, but most weekends since then, I’ve gone for a run, and that is a good start for me. Now of course none of this advice from the book is new, but Rubin has a way of presenting them that makes them something I internalize and want to implement. 5. Similar to not putting off nagging tasks, I’ve also tried to be proactive about nurturing friendships and introducing variety, novelty, and little projects to my life. In December, I reached out to a friend who had just moved back into the greater D.C. area and we met up to play board games at her house. My latest idea for a project has been to memorize songs from “The Great American Songbook” as I’ve had moments in my life where I’ve wished I had whole songs memorized instead of just snatches. So far, I’ve just memorized one: “Isn’t This a Lovely Day?” an Irving Berlin song from Top Hat. There are so many other ideas and quotes from The Happiness Project that I’ve stored away. I like the concept of taking pleasure in “an atmosphere of growth”. I like Rubin’s division of clutter into types: nostalgic clutter, aspirational clutter, bargain / freebie clutter, etc. I appreciate the reminder to not think about the return when committing acts of love and generosity. And of course there are other goals that I’ve articulated but not yet made progress on. I’m still bad about getting the amount of sleep I should. I have some nagging tasks I still haven’t resolved. I still read the comment sections online. Rubin makes it clear that her resolution chart was key to keeping her resolution. I tried to do a soft version of this, by writing notes in my day-planner but that hasn’t stuck. So I may need to look into my own version of a resolution chart for my more challenging changes. Of course it’s cooler not to be too happy. There’s a goofiness to happiness, an innocence, a readiness to be pleased. Zest and enthusiasm take energy, humility, and engagement; taking refuge in irony, exercising destructive criticism, or assuming an air of philosophical ennui is less taxing.